From this information, can we know in which parent the nondisjunction began? Suppose that a pregnant woman shows up to a clinic to get her fetus evaluated for chromosomal disorders. The tests revealed trisomy 9, and blood type A. The father is type AB and mother is type O (ABO blood type has been mapped on chromosome 9). 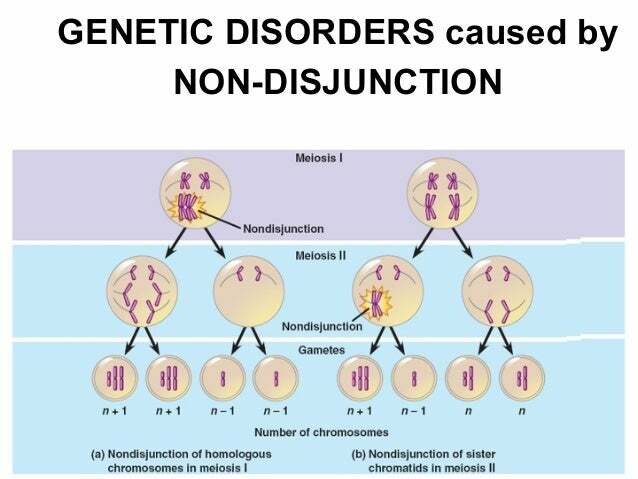 Nondisjunction occurs generally during female gamete formation. Nondisjunction means nonseparation: of either homologous chromosome in meiosis I or of sister chromatids in meiosis II. In both the cases abnormal gametes will be formed and after fertilisation, there will be trisomy or monosomy of chromosome. In the above case if non-disjunction of homologous chromosomes hapened in father then both alleles A and B would have entered single gamete (father with AB blood group means one chromosome 9 has A allele while the other homologous copy of chromosome 9 has B allele). That would have resulted in detection of AB blood type in the fetus; but it has A blood type. From mother, the baby can receive only recessive alleles, even if there is nondisjunction because the mother is of blood type O.